Since its introduction as an aid to the early detection of prostate cancer (PC) in the 1990s, routine prostate-specific antigen (PSA) testing has been associated with a stage migration toward increased diagnoses of organ-confined, low-grade PC.1-4 The result has been a significant decrease in both the percentage and absolute number of men presenting with metastatic disease as well as a 45% reduction in the age-adjusted PC-specific mortality rate.5 As such, men surviving PC are the largest population of male cancer survivors and represent approximately 40% of all cancer survivors.6 Despite these improvements, PSA testing has been criticized for its potentially negative impact. For example, many men have experienced unnecessary biopsies, and others have been overtreated for seemingly “indolent” prostate tumors that may not have been diagnosed without PSA testing. Furthermore, treatment for these non–life-threatening tumors has been associated with both significant financial cost and side effects, including erectile dysfunction, incontinence, and bowel issues.7-9 Thus, there is an urgent need for new biomarkers that distinguish aggressive from indolent PC. Identification and incorporation of these biomarkers into clinical practice will directly contribute to improved screening and treatment strategies. Family history of PC is one of the strongest risk factors predisposing to the development of PC.10-12 Specifically, it has been shown that PC is one of the most heritable of cancers, as studies of twins have shown that up to 42% of the risk can be explained by genetic factors. Despite this large genetic component, the study of cancer genetics has been, by and large, unable to identify common genetic variants that are associated with disease risk. However, over the past several decades, genetic research has witnessed a revolution in technologic advances that has provided more efficient and cost-effective ways to perform genetic sequencing. These advances have allowed for the identification of genetic variants in both germline and tumor DNA that increase a man’s risk for PC as well as aggressive disease.13-15 Because these genetic variations are expressed at different frequencies by every individual and within tumors, they hold great promise to personalize both screening and treatment algorithms for men with PC. Common variations within the human genome are called single nucleotide polymorphisms (SNPs) and are thought to directly contribute to the development of many complex diseases, including PC.16 As previously mentioned, many advances in high-throughput genotyping have enabled the performance of genome-wide association studies (GWAS) and even more recently detailed whole exome and whole genome sequencing studies. To date, these genetic association studies have identified approximately 100 SNPs that are associated with increased PC susceptibility and are thought to explain more than 35% of the heritable component of PC.17 Furthermore, since these germline SNPs are stable throughout a man’s lifetime and are not influenced by other disease processes (eg, inflammation, infection, benign prostate growth), there is interest in their use as biomarkers to improve PC screening strategies. Other investigations have recently evaluated larger and different panels of SNPs that have been validated for PC diagnosis on biopsy. It has been shown that when combined with clinical characteristics such as first-degree family history or PSA, the PC risk-associated SNPs can significantly improve prediction of biopsy results. For example, the results of a recent GWAS demonstrated that a panel of 23 PC risk-associated SNPs could be used in combination with PSA to significantly improve the prediction of prostate biopsy outcomes.28 Similarly, using a Swedish cohort of men who underwent a prostate biopsy during 2005 to 2007, it was shown that a genetic prediction model that included PC risk-associated SNPs and existing clinical variables (age, serum PSA, free-to-total PSA ratio, and family history) performed significantly better than a model that incorporated only clinical variables.29 Specifically, adding the PC risk-associated SNPs into a model significantly reduced the number of biopsies needed for detecting the same number of PC tumors in a cohort that used only the clinical variables. In another study, Kader et al30 compared the performance of 33 PC risk-associated SNPs with existing clinical parameters in predicting a positive prostate biopsy in the REDUCE (Reduction by Dutasteride of Prostate Cancer Events) trial. All men in the trial had an initial negative prostate biopsy and underwent study-mandated biopsies at 2 and 4 years.31 In this study, PC risk was estimated and ranked for each patient based on the best clinical model only and the combined clinical and genetic model (with 33 SNPs). The authors found that adding SNPs to the best clinical model reclassified PC risk in 33% of men, and the reclassified risk had a significantly better correlation to biopsy outcomes. In addition, the area under the curve (AUC) for discriminating prostate biopsy significantly increased from 0.62 using the best clinical model to 0.66 using the combined clinical and genetic model.30 Taken together, these results suggest that the genetic markers can be used to improve risk prediction. If incorporated into routine practice, they offer the possibility to improve screening practices by targeting those men who carry the highest number of SNPs and thereby help reduce the number of potentially unnecessary biopsies performed. Although PSA screening has been shown to save many lives, it may also have led to the overtreatment of many indolent PCs that would otherwise never have harmed patients.5 As such, there is a compelling need to identify biomarkers that can help distinguish aggressive from indolent PC disease. Although most common genetic variants identified to date are associated with PC risk, the majority of these studies did not focus on disease aggressiveness. Therefore, there is debate whether any of the approximately 100 SNPs17 associated with PC susceptibility are also associated with disease aggressiveness. Recent studies have attempted to evaluate this question of PC aggressiveness. For example, a candidate gene approach has been used to investigate a panel of genes that were previously associated with aggressive or advanced PC disease. The investigators interrogated almost 1000 SNPs in more than 150 different genes and found SNPs in 5 different genes (LEPR, RNASEL, IL4, CRY1, and ARVCF) that were significantly associated with deadly PC tumors.56 Although these studies have implicated a number of interesting candidate genes, follow-up studies are necessary to validate these findings and to fully understand their contributions to inherited risk for more aggressive PC. Several GWAS have also recently approached the topic of PC aggressiveness. For example, Xu et al57 and FitzGerald et al58 reported SNPs on chromosomes 17p12 and 15q13 that were present at significantly greater frequencies in men with aggressive disease. Similarly, Bensen et al59 reported that SNPs on chromosomes 3p12 and 8q24 were associated with PC aggressiveness. Ahn et al performed an association analysis between a panel of 12 SNPs and PC metastasis and biochemical recurrence using the Cancer Genetic Markers of Susceptibility database. Their results suggest that rs10993994 (chromosome 10q11; relative risk [RR] = 1.24), rs4242382 (chromosome 8q24; RR = 1.40), and rs6983267 (chromosome 8q24; RR = 0.67) were associated with metastatic PC.60 More recently, Lange et al61 reported loci on 8q24 and 11p15 that reached genome-wide significance in a study evaluating early-onset disease. Shui et al62 recently evaluated a panel of 47 established PC risk SNPs with the risk of PC-specific mortality. Their results demonstrate that the risk allele on rs11672691 was significantly associated with an increased risk for PC-specific mortality, whereas 7 SNPs had risk alleles that were significantly and inversely associated (rs13385191 [C2orf43], rs17021918 [PDLIM5], rs10486567 [JAZF1], rs6465657 [LMTK2], rs7127900 (intergenic), rs2735839 [KLK3], rs10993994 [MSMB], rs13385191 [C2orf43]). Taken together, it appears that many SNPs that have an association with PC risk also increase susceptibility to aggressive disease. Identification of a panel of these SNPs that increase the chance of a man developing metastatic disease or dying of PC may arguably be the key to individualized treatment for PC. Genetic changes that occur within the tumor (ie, somatic-level mutations) can also be characterized and used as potential biomarkers that help improve on personalized PC screening, detection, and treatment. In fact, many different FDA-approved and Clinical Laboratory Improvement Amendments (CLIA)-based tests that take advantage of somatic changes within prostate tumors are now available to help guide clinical decision making. Prostate cancer gene 3 (PCA3; formerly referred to as DD3) is a noncoding RNA produced in the prostate. It was shown to be overexpressed in 95% of prostate tumors, with a median 66-fold upregulation compared with adjacent noncancerous prostate tissue.63 Given its high specificity and overexpression in PC tissue, Progensa developed a urine-based test that measures the concentration of PCA3 RNA molecules and compares them with the PSA RNA concentration. A PCA3 score is calculated based on the ratio of these 2 concentrations that can aid in screening and detection.64 Several studies have demonstrated that PCA3 scores are significantly correlated with the percentage of men with biopsy-proven PC, and that it has reported sensitivities and specificities up to 76% and 90%, respectively.65 Other research has suggested that PCA3 scores correlate with prostatectomy Gleason score and tumor volume,66,67 although this is subject to debate.68 However, this urine-based biomarker has the potential to add to current algorithms in identifying men who should be offered a biopsy and/or who may harbor aggressive tumors. Overall, PCA3 appears promising, but further prospective studies in larger populations are needed to confirm these results. There is a high frequency of gene fusions within prostate tumors.69 For example, it has been reported that the transmembrane protease, serine 2 v-ets erythroblastosis virus E26 oncogene homolog (avian) (TMPRSS2-ERG) translocation is present in approximately half of all prostate tumors.70 The usefulness of TMPRSS2-ERG and other translocations in PC diagnosis and their impact on clinical outcome is an area of active research. For example, TMPRSS2-ERG has been implicated as both a negative and positive prognostic tumor marker.71 In a large multi-institutional study, it was demonstrated that when TMPRSS2-ERG levels are measured along with urinary PCA3 levels, they can be used to help predict whether a man will have a positive biopsy and/or aggressive cancer (eg, increased Gleason grade disease).72,73 The Mi-Prostate Score (University of Michigan Health System) combines the urine tests for PCA3 from Progensa, TMPRSS2-ERG, and serum PSA levels to produce a risk assessment of PC that potentially indicates the likelihood of aggressive cancer.74 Taken together, it appears that testing for these gene products and fusion proteins, alone or in combination with other tests, could be used to improve screening and treatment decisions for men at risk of PC. 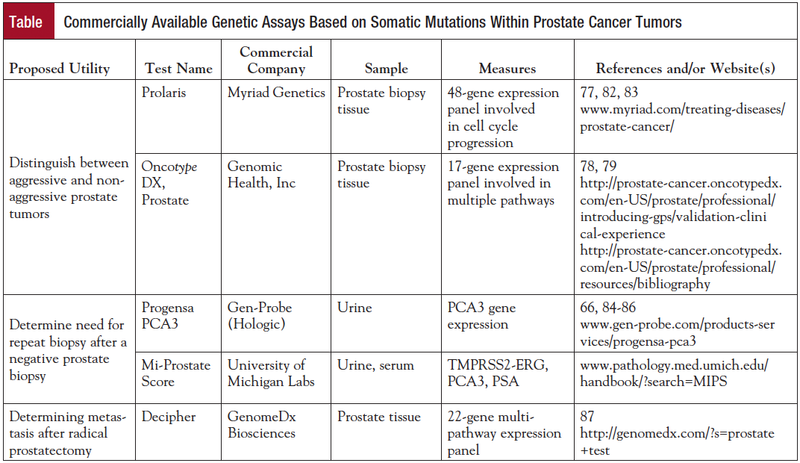 Myriad Genetics offers an assay (Prolaris) of prostate biopsy tissue that compares the expression of 46 different genes mainly focused on cell cycle progression within formalin-fixed paraffin-embedded tissue obtained by biopsy or prostatectomy tissue.75,76 When applied to populations of men with seemingly low-risk PC undergoing either watchful waiting or active surveillance, it has been found that low expression is associated with a low risk of disease progression, whereas high expression is more indicative of higher risk of disease progression. Knowledge of a high expression score may help guide a clinician toward recommending closer monitoring, earlier intervention, or additional therapy. When the Prolaris test has been applied to radical prostatectomy specimens, it has been shown that higher scores are associated with an increased likelihood of biochemical recurrence and PC-specific mortality.77 This information may help personalize a man’s treatment by helping to guide a patient toward understanding the need for additional therapies. Genomic Health Inc offers a CLIA-approved test called Oncotype DX, Prostate. This test determines the expression of 17 different genes involved in androgen signaling, cell organization, and proliferation.78,79 The expression levels of this panel are algorithmically combined to calculate a Genomic Prostate Score (GPS). The GPS has been shown to predict both upgrading and/or upstaging at the time of radical prostatectomy.80 Thus, this test has potential to significantly influence the decision for immediate treatment or continued observation in patients undergoing active surveillance. The Decipher test (GenomeDx Biosci­enes) is a different assay of formalin-fixed tumor tissue obtained from prostatectomy specimens that measures the expression levels of 22 RNA biomarkers involved in multiple biologic pathways that have been associated with aggressive PC.81 The assay uses this genetic information to independently predict the probability of metastasis after surgery and provides an independent assessment of tumor aggressiveness. Although many of these novel clinical tests are still under investigation, await validation, and are associated with proprietary information, they could be useful to significantly improve the field of PC by providing more personalized ways to guide clinical decision making in terms of treatment and subsequent surveillance. The past decade has witnessed major advancements in genetic sequencing technologies that have directly and proportionately increased our understanding of the genetic basis of PC. Specifically, there are now almost 100 different variations within germline DNA and a similar number of mutations within prostate tumors that have reproducibly been associated with PC susceptibility and aggressiveness. Although this review has described many of the commercially available tests that have capitalized on these genetic variations (Table), it is by no means intended to be comprehensive. In fact, many more genetic tests devoted toward predicting PC outcomes are becoming increasingly available. 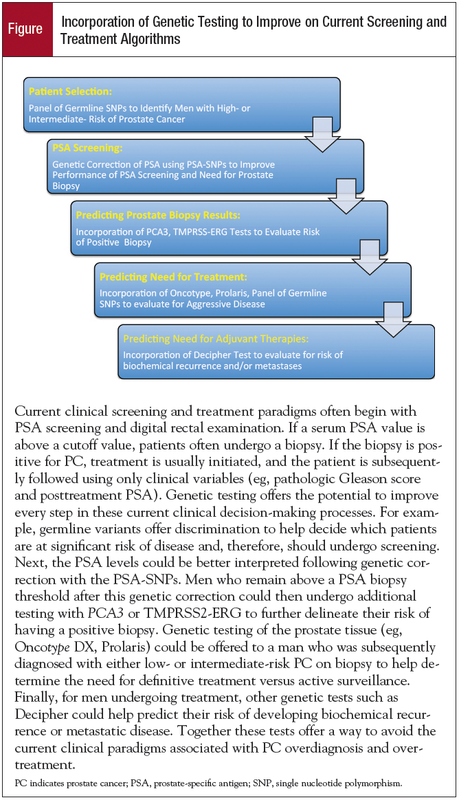 Incorporation of these tests into clinical practice offers potential to provide improvements in 1) patient selection for PC screening (eg, using germline PC risk SNPs), 2) PSA interpretation (eg, using PSA-SNPs to genetically correct PSA), 3) decision for biopsy (eg, using PCA3, TMPRSS2-ERG), 4) decision for treatment (eg, using Mi-Prostate Score, Oncotype DX, Prolaris), and 5) decision for adjuvant therapy based on risk of metastases and mortality (eg, using Prolaris and Decipher) (Figure). Finally, it is important to note that although excellent progress has been made in delineating the genetic basis of PC, more genetic studies are needed to better understand the genetic susceptibility to PC, especially aggressive tumors. Such genetic markers would be extremely important to address the current debate on PSA screening, overdiagnosis, and overtreatment of PC. Identification and refinement of these genetic variants will permit additional tools that can be incorporated into algorithms that can improve current clinical practices. Bartsch G, Horninger W, Klocker H, et al. Tyrol Prostate Cancer Demonstration Project: early detection, treatment, outcome, incidence and mortality. BJU Int. 2008;101:809-816. Desireddi NV, Roehl KA, Loeb S, et al. Improved stage and grade-specific progression-free survival rates after radical prostatectomy in the PSA era. Urology. 2007;70:950-955. Amling CL. Prostate-specific antigen and detection of prostate cancer: what have we learned and what should we recommend for screening? Curr Treat Options Oncol. 2006;7:337-345. Trinchieri A, Moretti R. Trends in prostate cancer epidemiology in the year 2000. Arch Ital Urol Androl. 2005;77:164-166. Loeb S, Catalona WJ. Prostate-specific antigen screening: pro. Curr Opin Urol. 2010;20:185-188. Paquette EL, Sun L, Paquette LR, et al. Improved prostate cancer-specific survival and other disease parameters: impact of prostate-specific antigen testing. Urology. 2002;60:756-759. Sanda MG, Dunn RL, Michalski J, et al. Quality of life and satisfaction with outcome among prostate-cancer survivors. N Engl J Med. 2008;358:1250-1261. Wilt TJ, Brawer MK, Jones KM, et al. Radical prostatectomy versus observation for localized prostate cancer. N Engl J Med. 2012;367:203-213. Ficarra V, Novara G, Rosen RC, et al. Systematic review and meta-analysis of studies reporting urinary continence recovery after robot-assisted radical prostatectomy. Eur Urol. 2012;62:405-417. Carter BS, Beaty TH, Steinberg GD, et al. Mendelian inheritance of familial prostate cancer. Proc Natl Acad Sci U S A. 1992;89:3367-3371. Eeles RA. Genetic predisposition to prostate cancer. Prostate Cancer Prostatic Dis. 1999;2:9-15. Edwards SM, Eeles RA. Unravelling the genetics of prostate cancer. Am J Med Genet C Semin Med Genet. 2004;129C:65-73. Isaacs WB. Inherited susceptibility for aggressive prostate cancer. Asian J Androl. 2012;14:415-418. Catalona WJ, Bailey-Wilson JE, Camp NJ, et al. National Cancer Institute Prostate Cancer Genetics Workshop. Cancer Res. 2011;71:3442-3446. Choudhury AD, Eeles R, Freedland SJ, et al. The role of genetic markers in the management of prostate cancer. Eur Urol. 2012;62:577-587. Kruglyak L, Nickerson DA. Variation is the spice of life. Nat Genet. 2001;27:234-236. Eeles RA, Olama AA, Benlloch S, et al. Identification of 23 new prostate cancer susceptibility loci using the iCOGS custom genotyping array. Nat Genet. 2013;45:385-391. Zheng SL, Sun J, Wiklund F, et al. Cumulative association of five genetic variants with prostate cancer. N Engl J Med. 2008;358:910-919. Xu J, Sun J, Kader AK, et al. Estimation of absolute risk for prostate cancer using genetic markers and family history. Prostate. 2009;69:1565-1572. Kote-Jarai Z, Easton DF, Stanford JL, et al. Multiple novel prostate cancer predisposition loci confirmed by an international study: the PRACTICAL Consortium. Cancer Epidemiol Biomarkers Prev. 2008;17:2052-2061. Helfand BT, Kan D, Modi P, et al. Prostate cancer risk alleles significantly improve disease detection and are associated with aggressive features in patients with a “normal” prostate specific antigen and digital rectal examination. Prostate. 2011;71:394-402. Wang M, Liu F, Hsing AW, et al. Replication and cumulative effects of GWAS-identified genetic variations for prostate cancer in Asians: a case-control study in the ChinaPCa consortium. Carcinogenesis. 2012;33:356-360. Chen M, Huang YC, Yang S, et al. Common variants at 8q24 are associated with prostate cancer risk in Taiwanese men. Prostate. 2010;70:502-507. Kader AK, Sun J, Isaacs SD, et al. Individual and cumulative effect of prostate cancer risk-associated variants on clinicopathologic variables in 5,895 prostate cancer patients. Prostate. 2009;69:1195-1205. Wiklund FE, Adami HO, Zheng SL, et al. Established prostate cancer susceptibility variants are not associated with disease outcome. Cancer Epidemiol Biomarkers Prev. 2009;18:1659-1662. Sun J, Chang BL, Isaacs SD, et al. Cumulative effect of five genetic variants on prostate cancer risk in multiple study populations. Prostate. 2008;68:1257-1262. Helfand BT, Loeb S, Kan D, et al. Number of prostate cancer risk alleles may identify possibly ‘insignificant’ disease. BJU Int. 2010;106:1602-1606. Gudmundsson J, Besenbacher S, Sulem P, et al. Genetic correction of PSA values using sequence variants associated with PSA levels. Sci Transl Med. 2010;2:62ra92. Aly M, Wiklund F, Xu J, et al. Polygenic risk score improves prostate cancer risk prediction: results from the Stockholm-1 cohort study. Eur Urol. 2011;60:21-28. Kader AK, Sun J, Reck BH, et al. Potential impact of adding genetic markers to clinical parameters in predicting prostate biopsy outcomes in men following an initial negative biopsy: findings from the REDUCE trial. Eur Urol. 2012;62:953-961. Andriole GL, Bostwick DG, Brawley OW, et al. Effect of dutasteride on the risk of prostate cancer. N Engl J Med. 2010;362:1192-1202. Helfand BT, Loeb S, Hu Q, et al. Personalized prostate specific antigen testing using genetic variants may reduce unnecessary prostate biopsies. J Urol. 2013;189:1697-1701. Bansal A, Murray DK, Wu JT, et al. Heritability of prostate-specific antigen and relationship with zonal prostate volumes in aging twins. J Clin Endocrinol Metab. 2000;85:1272-1276. Pilia G, Chen WM, Scuteri A, et al. Heritability of cardiovascular and personality traits in 6,148 Sardinians. PLoS Genet. 2006;2:e132. Loeb S. Germline sequence variants and prostate-specific antigen interpretation. Clin Chem. 2011;57:662-663. Loeb S, Carter HB, Walsh PC, et al. Single nucleotide polymorphisms and the likelihood of prostate cancer at a given prostate specific antigen level. J Urol. 2009;182:101-104. Guy M, Kote-Jarai Z, Giles GG, et al. Identification of new genetic risk factors for prostate cancer. Asian J Androl. 2009;11:49-55. Nam RK, Zhang WW, Klotz LH, et al. Variants of the hK2 protein gene (KLK2) are associated with serum hK2 levels and predict the presence of prostate cancer at biopsy. Clin Cancer Res. 2006;12:6452-6458. Lose F, Batra J, O’Mara T, et al. Common variation in Kallikrein genes KLK5, KLK6, KLK12, and KLK13 and risk of prostate cancer and tumor aggressiveness. Urol Oncol. 2013;31:635-643. Pomerantz MM, Werner L, Xie W, et al. Association of prostate cancer risk loci with disease aggressiveness and prostate cancer-specific mortality. Cancer Prev Res (Phila). 2011;4:719-728. Kohli M, Rothberg PG, Feng C, et al. Exploratory study of a KLK2 polymorphism as a prognostic marker in prostate cancer. Cancer Biomark. 2010;7:101-108. Cheng I, Plummer SJ, Neslund-Dudas C, et al. Prostate cancer susceptibility variants confer increased risk of disease progression. Cancer Epidemiol Biomarkers Prev. 2010;19:2124-2132. Cramer SD, Sun J, Zheng SL, et al. Association of prostate-specific antigen promoter genotype with clinical and histopathologic features of prostate cancer. Cancer Epidemiol Biomarkers Prev. 2008;17:2451-2457. Pal P, Xi H, Sun G, et al. Tagging SNPs in the kallikrein genes 3 and 2 on 19q13 and their associations with prostate cancer in men of European origin. Hum Genet. 2007;122:251-259. Lu X, Zhao W, Huang J, et al. Common variation in KLKB1 and essential hypertension risk: tagging-SNP haplotype analysis in a case-control study. Hum Genet. 2007;121:327-335. Cramer SD, Chang BL, Rao A, et al. Association between genetic polymorphisms in the prostate-specific antigen gene promoter and serum prostate-specific antigen levels. J Natl Cancer Inst. 2003;95:1044-1053. Parikh H, Wang Z, Pettigrew KA, et al. Fine mapping the KLK3 locus on chromosome 19q13.33 associated with prostate cancer susceptibility and PSA levels. Hum Genet. 2011;129:675-685. Vickers A, Cronin A, Roobol M, et al. Reducing unnecessary biopsy during prostate cancer screening using a four-kallikrein panel: an independent replication. J Clin Oncol. 2010;28:2493-2498. Vickers AJ, Cronin AM, Roobol MJ, et al. A four-kallikrein panel predicts prostate cancer in men with recent screening: data from the European Randomized Study of Screening for Prostate Cancer, Rotterdam. Clin Cancer Res. 2010;16:3232-3239. Donin NM, Loeb S, Cooper PR, et al. Genetically adjusted prostate-specific antigen values may prevent delayed biopsies in African-American men. BJU Int. 2014;114:E50-E55. Odedina FT, Akinremi TO, Chinegwundoh F, et al. Prostate cancer disparities in Black men of African descent: a comparative literature review of prostate cancer burden among Black men in the United States, Caribbean, United Kingdom, and West Africa. Infect Agent Cancer. 2009;4(suppl 1):S2. Williams H, Powell IJ. Epidemiology, pathology, and genetics of prostate cancer among African Americans compared with other ethnicities. Methods Mol Biol. 2009;472:439-453. Powell IJ, Banerjee M, Bianco FJ, et al. The effect of race/ethnicity on prostate cancer treatment outcome is conditional: a review of Wayne State University data. J Urol. 2004;171:1508-1512. Ishak MB, Giri VN. A systematic review of replication studies of prostate cancer susceptibility genetic variants in high-risk men originally identified from genome-wide association studies. Cancer Epidemiol Biomarkers Prev. 2011;20:1599-1610. Scardino PT. Prostate cancer: improving PSA testing by adjusting for genetic background. Nat Rev Urol. 2013;10:190-192. Lin DW, FitzGerald LM, Fu R, et al. Genetic variants in the LEPR, CRY1, RNASEL, IL4, and ARVCF genes are prognostic markers of prostate cancer-specific mortality. Cancer Epidemiol Biomarkers Prev. 2011;20:1928-1936. Xu J, Zheng SL, Isaacs SD, et al. Inherited genetic variant predisposes to aggressive but not indolent prostate cancer. Proc Natl Acad Sci U S A. 2010;107:2136-2140. FitzGerald LM, Kwon EM, Conomos MP, et al. Genome-wide association study identifies a genetic variant associated with risk for more aggressive prostate cancer. Cancer Epidemiol Biomarkers Prev. 2011;20:1196-1203. Bensen JT, Xu Z, Smith GJ, et al. Genetic polymorphism and prostate cancer aggressiveness: a case-only study of 1,536 GWAS and candidate SNPs in African-Americans and European-Americans. Prostate. 2013;73:11-22. Ahn J, Kibel AS, Park JY, et al. Prostate cancer predisposition loci and risk of metastatic disease and prostate cancer recurrence. Clin Cancer Res. 2011;17:1075-1081. Lange EM, Johnson AM, Wang Y, et al. Genome-wide association scan for variants associated with early-onset prostate cancer. PLoS One. 2014;9:e93436. Shui IM, Lindstrom S, Kibel AS, et al. Prostate cancer (PCa) risk variants and risk of fatal PCa in the National Cancer Institute Breast and Prostate Cancer Cohort Consortium. Eur Urol. 2014;65:1069-1075.
de Kok JB, Verhaegh GW, Roelofs RW, et al. DD3(PCA3), a very sensitive and specific marker to detect prostate tumors. Cancer Res. 2002;62:2695-2698. Hessels D, Klein Gunnewiek JM, van Oort I, et al. DD3(PCA3)-based molecular urine analysis for the diagnosis of prostate cancer. Eur Urol. 2003;44:8-15. Deras IL, Aubin SM, Blase A, et al. PCA3: a molecular urine assay for predicting prostate biopsy outcome. J Urol. 2008;179:1587-1592. Nakanishi H, Groskopf J, Fritsche HA, et al. PCA3 molecular urine assay correlates with prostate cancer tumor volume: implication in selecting candidates for active surveillance. J Urol. 2008;179:1804-1809. Lin DW, Newcomb LF, Brown EC, et al. Urinary TMPRSS2:ERG and PCA3 in an active surveillance cohort: results from a baseline analysis in the Canary Prostate Active Surveillance Study. Clin Cancer Res. 2013;19:2442-2450. Whitman EJ, Groskopf J, Ali A, et al. PCA3 score before radical prostatectomy predicts extracapsular extension and tumor volume. J Urol. 2008;180:1975-1978. Kumar-Sinha C, Tomlins SA, Chinnaiyan AM. Recurrent gene fusions in prostate cancer. Nat Rev Cancer. 2008;8:497-511. Tomlins SA, Rhodes DR, Perner S, et al. Recurrent fusion of TMPRSS2 and ETS transcription factor genes in prostate cancer. Science. 2005;310:644-648. Tomlins SA, Bjartell A, Chinnaiyan AM, et al. ETS gene fusions in prostate cancer: from discovery to daily clinical practice. Eur Urol. 2009;56:275-286. Stephan C, Jung K, Semjonow A, et al. Comparative assessment of urinary prostate cancer antigen 3 and TMPRSS2:ERG gene fusion with the serum [-2]proprostate-specific antigen-based prostate health index for detection of prostate cancer. Clin Chem. 2013;59:280-288. Tomlins SA, Aubin SM, Siddiqui J, et al. Urine TMPRSS2:ERG fusion transcript stratifies prostate cancer risk in men with elevated serum PSA. Sci Transl Med. 2011;3:94ra72. Young A, Palanisamy N, Siddiqui J, et al. Correlation of urine TMPRSS2:ERG and PCA3 to ERG+ and total prostate cancer burden. Am J Clin Pathol. 2012;138:685-696. Crawford ED, Scholz MC, Kar AJ, et al. Cell cycle progression score and treatment decisions in prostate cancer: results from an ongoing registry. Curr Med Res Opin. 2014;30:1025-1031. Shore N, Concepcion R, Saltzstein D, et al. Clinical utility of a biopsy-based cell cycle gene expression assay in localized prostate cancer. Curr Med Res Opin. 2014;30:547-553. Cooperberg MR, Simko JP, Cowan JE, et al. Validation of a cell-cycle progression gene panel to improve risk stratification in a contemporary prostatectomy cohort. J Clin Oncol. 2013;31:1428-1434. Klein EA, Cooperberg MR, Magi-Galluzzi C, et al. A 17-gene assay to predict prostate cancer aggressiveness in the context of Gleason grade heterogeneity, tumor multifocality, and biopsy undersampling. Eur Urol. 2014;66:550-560. Knezevic D, Goddard AD, Natraj N, et al. Analytical validation of the Oncotype DX prostate cancer assay – a clinical RT-PCR assay optimized for prostate needle biopsies. BMC Genomics. 2013;14:690. Cooperberg MR, Simko JP, Falzarano S, et al. Development and validation of the biopsy-based genomic prostate score (GPS) as a predictor of high grade or extracapsular prostate cancer to improve patient selection for active surveillance. Paper presented at: American Urological Association Annual Meeting; May 4-8, 2013; San Diego, CA. Abstract 2131. Ross AE, Feng FY, Ghadessi M, et al. A genomic classifier predicting metastatic disease progression in men with biochemical recurrence after prostatectomy. Prostate Cancer Prostatic Dis. 2014;17:64-69. Cuzick J, Swanson GP, Fisher G, et al. Prognostic value of an RNA expression signature derived from cell cycle proliferation genes in patients with prostate cancer: a retrospective study. Lancet Oncol. 2011;12:245-255. Cuzick J, Berney DM, Fisher G, et al. Prognostic value of a cell cycle progression signature for prostate cancer death in a conservatively managed needle biopsy cohort. Br J Cancer. 2012;106:1095-1099. Bussemakers MJ, van Bokhoven A, Verhaegh GW, et al. DD3: a new prostate-specific gene, highly overexpressed in prostate cancer. Cancer Res. 1999;59:5975-5979.
de la Taille A. Progensa PCA3 test for prostate cancer detection. Expert Rev Mol Diagn. 2007;7:491-497. Kirby R. PCA3 improves diagnosis of prostate cancer. Practitioner. 2007;251:18, 21, 23. Badani K, Thompson DJ, Buerki C, et al. Impact of a genomic classifier of metastatic risk on postoperative treatment recommendations for prostate cancer patients: a report from the DECIDE study group. Oncotarget. 2013;4:600-609.